As a professional concrete batching plant producer, Zhengzhou CamelWay Machinery has produced concrete batching equipment which can satisfy your different requirements. JS concrete mixers(small concrete mixer, large concrete mixer, portable concrete mixer, forced concrete mixer, twin shaft concrete mixer, double shaft concrete mixer, compulsory concrete mixer,mobile concrete mixer, sicoma planetary concrete mixer, planetary concrete mixer, biaxial forced mixer, ready-mixed concrete mixer, concrete batching machines, stabilized soil mixing stations, wheel loaders, concrete transport tanks, concrete tank car, concrete tank truck, JZC concrete mixers, JZM concrete mixer,JDC concrete mixer and other construction machinery. 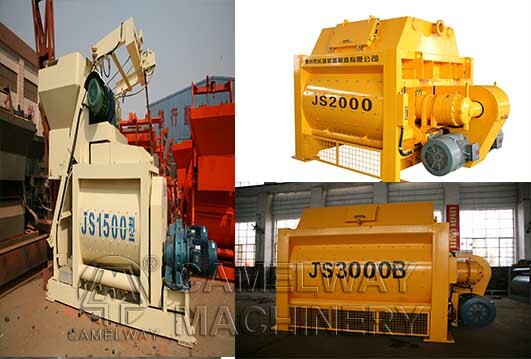 Forced type concrete mixer can be divided into two types. One is twin shaft concrete mixer and the other is planetary concrete mixer. Their working principles are very similar. They both mix concrete through the rotation of the shaft. Meanwhile the blades attached to the shaft are just like many hands to mix the concrete more homogeneous. The difference between them is that twin shaft concrete mixer has two horizontal shafts while the planetary concrete mixer has one vertical concrete mixer.